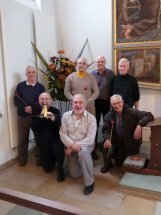 The “Flowerpot men” were formed some five years ago following a flower display demonstration in the church. The church flowers have always been the preserve of the women of the parish, The St Michaels Guild, who seem to have the touch with design and decoration. At the demonstration, male members of the audience were invited to try their hand at arrangement. “Easy”, we all said. Foolish words we now realize, but as a result a group of men decided to give the women a run for their money. Obviously we need lots of ‘meetings’ to organize our displays but once or twice a year we are invited to design the flowers for a Sunday Service. Great fun and enormous entertainment for all concerned. All are welcome and who knows, you might just get invited to provide a display for the next All Saints’ Flower Festival, as we were in 2009 when our creation entitled ‘World Cup’ won praise and acclaim from the professionals!